We are now in our twenty-first month of the “Cottage Cooking Club”; a group of international blogger's that post our thoughts and experiences on the recipes that we have prepared from Hugh Fearnley-Whittingstall's cookbook, "River Cottage Veg". Our group is meant to be a project aimed at incorporating more vegetable dishes in our everyday cooking, and is and has been inspired by our dedicated leader Andrea of the The Kitchen Lioness. Every month Andrea picks one recipe from each of the ten chapters. We then pick and choose which one or ones we want to blog about in a single post. Our motto for the month of January was to “start the new year off with incorporating even more veggies into our cooking”! For the first recipe I prepared the winter kale and potato curry. First garlic, ginger and a green chili was pounded together to create a paste for extra flavor, onions were sautéed and then a wonderful blend of spices, garam masala, mustard seeds, cumin, turmeric and cardamom were added, indeed a great combination to create great flavor. Potatoes and chard stalks were added and then the leaves. Yogurt and tomato paste were mixed together and added at the end, then the dish was finished with cilantro. What a satisfying and hearty meal this made, easy enough for a week-night meal. For the second recipe I prepared the curried red lentil soup. I have made other lentil soups, a few very similar to this. I almost forgot how beautiful red lentils can be, until they have been cooked as you can see by the above picture. My soup was a little thin so I simmered longer than the recipe required until the liquid became the right consistency. I added a little more lemon juice than the recommended amount and was very pleased. Garnished soup with cilantro, very delicious! Now for the third and last dish. 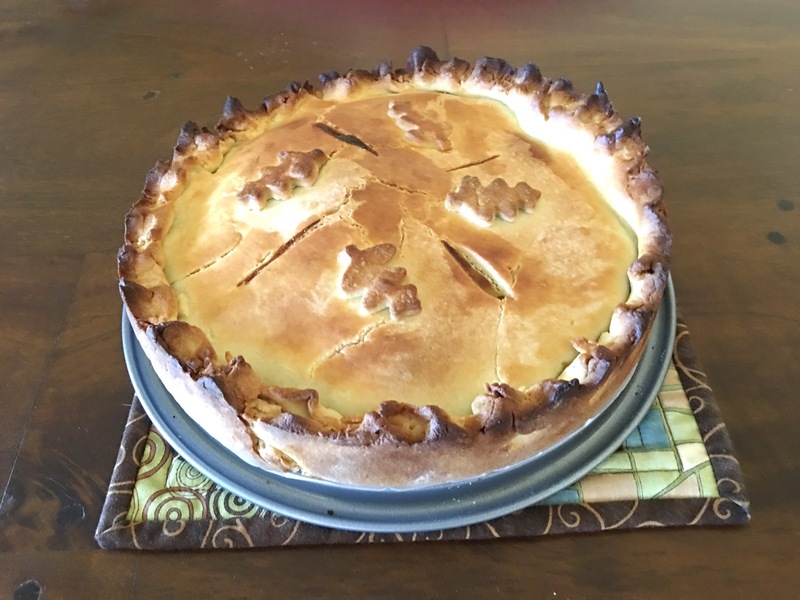 This was a sweet pie that is filled with Swiss chard, raisins soaked in apple brandy and apples. It is bound together by two eggs and then pine nuts are added. The dough is sweetened by the addition of confectioners’ sugar and works surprisingly well with the filling. The directions have us baking this in a spring form pan. At this point I was unsure of how to prepare the pan so I cut a piece of parchment to cover the bottom. For me this was a fairly time consuming recipe but one that I will be preparing again. Verdict, another winner! Recipes adapted from the River Cottage Veg, by Hugh Fearnley-Whittingstall. First recipe; from the chapter "Comfort Food and Feast" Winter kale and potato curry (page 24). 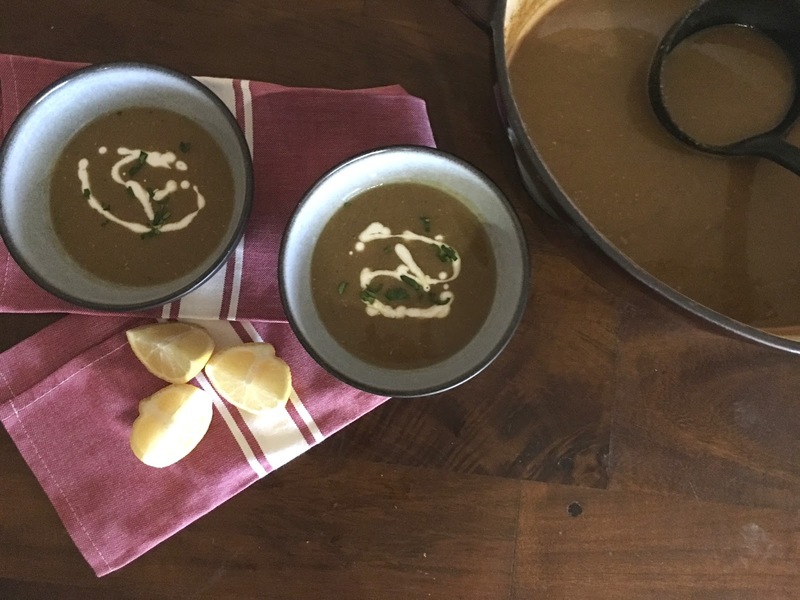 Second dish from the chapter "Hefty Soups” Curried red lentil soup” (page 166). And last but not least; From the chapter "Side Dishes" Tourte de blettes (page 398). To see what recipes the other members chose for this month, head over to the LYL post for January on the CCC website, by clicking clicking here. Just a note to everyone On 1st May, 2016, Andrea will continue our cooking adventure together - with two books from the same author. One is called "River Cottage Every Day" and the other one is called "Love Your Leftovers". Please join us for another new adventure! I can’t wait! I love the color of red lentils! Wish they'd stay the same hue when cooked, but alas they don't. Good, anyway. And that pie looks so intriguing! I sometimes use Swiss chard or other greens in savory pies (like a meat pie, but vegetarian), but never in a sweet pie. Gotta try that! Thanks so much. Hi John, I was a little curious about the pie myself, but the flavors really worked together very well, it was my pics of the inside of the pie that did not. What a fun event, Cheri! I'm so bad at choosing for events like this. Looks like you've chosen some real winners:) That pie is amazing too!!! I would never imagine such ingredients would work so well but, it looks like they most certainly do! Thanks Louise, our cooking club has been together for almost 2 years now, it's been a lot of fun. I have always wanted to try a swiss chard pie. Yours turned out so gorgeous! And who doesn't love pie? Perfect, Cheri! Thanks Abbe, this was my first sweet and savory pie, had fun with this one. What a great club and it sounds like fun. Sweet and savory sounds delicious. Thanks Linda, we are having a great time cooking together, it's fun to compare notes. Your sweet pie is most impressive. I already could tell it was a time-consuming recipe and I applaud your making it. You really chose the most challenging recipe of the month. I like lentil soap but I must agree with you - the red lentil soup had such a lovely color and look. The winter kale and potato curry didn't look especially appealing to me. I can see that I was mistaken. Very nice post, Cheri. Thanks Mary, wish I would of made the spiced Moroccan couscous that you made, so fun to compare. Thanks Tandy, it was a simple dish with lots of flavor. Very impressive sweet pie you got there! Well done! I hope to get to the red lentil soup soon. All three were great choices, you did well! Thanks Emily, will pop on over to see how you did, another great month. WOW! I love all the three recipes here. But I want to try potato and kale curry soon! Thanks Kushi, we enjoyed the curry very much. Wonderful choices! I've made the first two, but haven't tried the pie. I'm curious about it, but will have to wait until I have occasion to feed a non-gluten-free and vegan crowd! Hi Teresa, I was very surprised about the pie, very good. Another great CCC month. Thanks D, it was another great month. Andrea is starting up again with 2 more of his books. Beautiful, all of the photos! I wish I'd placed some parchment at the bottom of the springform pan for the tourte de blette, and I will next time I make it. I, too, loved that dessert, though it was fairly time consuming. I'm excited to cook in the next book, too, as the recipes are generally so easy and tasty! Hi Prof Katie, I thought it was very time consuming too, but well worth it. the next book will be great too, can't wait. I always enjoy these posts - the recipes inspire and your reviews are well written and helpful. Great post and wonderful recipes. Thanks Tricia, I am having fun cooking in a group and comparing notes. Have a great week-end my friend! More vegetables is always good, but now I just want that Swiss chard pie!! Absolutely glorious, Cheri. Thanks Angie, so glad I prepared the pie, it was a little time consuming but well worth it. Hi Cheri, looks like our tastes coincided again and I very much enjoyed the winter kale and potato curry, along with the curried red lentil soup, though I'm always sad when the bright color of the beans fade, kind of like bright green tomatillos once cooked. Your Tourte de blette looks beautiful and sounds lovely. I had earlier cooked the Swiss chard to prepare this choice as well but other things came up, thus I ended up using the chard in a soup. Good to keep in mind for another juncture though. Happy hiking and see you soon. Kale and potato curry sounds like the perfect Winter dinner! Thanks Pamela, it really is, next time I might ramp up the spices a little more but besides that it is a great dish. Take care! All three sound delicious, Cheri, and I'm a big fan of lentil soup in the winter but that pie is gorgeous! Thanks Susan, the pie was really a surprise, was not sure if the sweet and savory ingredients would marry well, but they really did. Thanks Vidya, the pie was sweet and savory and tasted very good, have a great week-end. Thanks for sharing and have a wonderful weekend ^-^! Hi Karen, we loved the curry too, easy to make. Happy week-end to you! 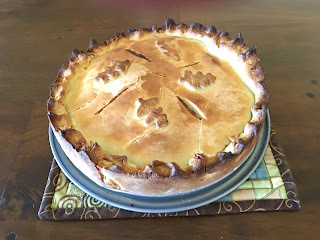 Dear Cheri, you win this month - you actually made the Tourte de blette (Swiss Chard Tart) and the Winter kale and potato curry - the two dishes that I did not manage this month! All of them looks amazing and I just know that following your raving review I will have to make that lovely sweet and savory dessert tart - as soon as I can find bright, fresh and beautiful Swiss chard! You really did a wonderful job with it! And with your other two lovely dishes as well! So glad to read that you enjoyed all three of them! And thank you very much for your continued support and enthusiasm for the Cottage Cooking Club! Your know that I really appreciate it! Thanks Andrea, another great month, cannot believe we have been at it almost 2 years now, it's been an amazing experience.Thanks!! Your dishes look fabulous Cheri! I'm so impressed that you tackled the tourte; it did seem to be a lot of work but it sounds like it was worth the effort. Thanks Zosia, I prepared the dough and the chard the day before, but still it was some work and a lot of clean-up as I am quite the messy baker. :) Another great month. I'd happily try any of those recipes. I've made a few things from his cookbooks, but obviously not as many as you! Hi Beth, I love that most of his recipes are simple and delicious, it's been almost 2 years now that we have been working our way through his book, time goes by so fast. Take care! Wow, Cheri, I am blown away by all three recipes! The first one has an amazing combination of flavors and I am so curious to have a bite of that deliciousnes! I don't make enough lentil soup and it's so good for you that I need to do it more often. Hi Robyn, you are so sweet, my baking skills are still a work in progress and the mess I create in the kitchen is kind of crazy. happy week-end to you! Thanks Liz, my daughter was pretty picky growing up too. 21st month? that's incredible Cheri, what a great club and way to try new recipes. These look great as always! Thanks Phi, i know it's been a long time. I can't believe it's been 21 months! Of course I didn't join until a few months in, but still... My choices didn't overlap yours so I'm glad to know yours were winners. I can make them when I have a chance. The soup looks particularly appealing. Thanks Betsy, I finally figured out why my soup did not look like everyone else's......did not add coconut milk. Mmm Your hearty kale / curry / lentil dishes, pie and soup recipes have arrived just in time for a snap of cold weather in SoCal...I'm seriously intrigued by the sweet kale pie...Your photos Cheri have me thinking that maybe you should open a cafe =) Bet you'd have a queue outside the restaurant with the Ninja Baker at the very front! Hi Kim, you can have a bakery right next door, we would be a team. lol! Thanks Ritu, it was another great month cooking with the CCC. The pie reminds me so much of the Torta di Erbe we had in Lucca - Mark's favorite memory from the trip! I need to try it. Hi David, isn't wonderful how food, travel and memories all go hand in hand. Have a great week-end, nice weather we are having. Your dishes look terrific. I made the soup too - not so pretty, but very tasty. I bet the pie was fun - great idea!! Hi Candy, the pie was good but very time consuming. Take care!